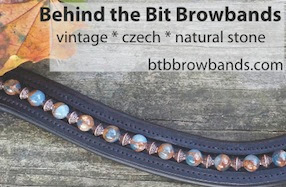 Behind the Bit: Brown is the new black: Dressage saddle for sale! Brown is the new black: Dressage saddle for sale! How I came to own this saddle is a long-ish story, but while I like it, and love the adjustable tree, it is too small for me (I was hoping I could squeeze into it). It is an older model Lovatt & Ricketts 17" adjustable tree (easy turnkey system). If you aren't familiar with L&R their saddles are designed for low-withered horses -- Arabs, Morgans, Quarter Horses, and their name used to be the Arabian Saddle Company (I think?). I have ridden in it several times -- a nice, comfortable, close-contact saddle to sit in and while some adjustable trees just don't "sit well" on a horse, this one fits Riley, a medium and another horse who is a wide, once adjusted. I actually can't believe it fits Riley :-). I'm asking $1K. This may be forward, but if you are looking for larger one I happen to have one. I have an 18" Rembrandt Vanguard with the Wellup tree in the same lovely chocolate brown color. Please let me know if you would be interested in it.